ALAN MUNDE GAZETTE TAB BOOK – This self-titled album is my latest group effort and one that I am very, very, very proud of. It features the fine talents of Phill Elliott on vocals and guitar, Bill Honker on vocals and bass, and Glenn Mitchell on vocals and mandolin. It features some of my best group work on “Hamilton County Breakdown” – I am especially proud of this as I have been trying many years to get a really good arrangement of this; “Misty Morning Amble” – a very nice original of mine in B minor; “This Morning at Nine” – a tribute to my mentor Eddie Shelton; “Don’t Think Twice” – a real showpiece for vocalist Phill Elliott. There are 13 songs in all and each one a gem. ALAN MUNDE, BLUE RIDGE EXPRESS TAB BOOK – All banjo solos from the compilation CD of the same name. ALAN MUNDE, FESTIVAL FAVORITES, REVISITED TAB BOOK – Several years ago I recorded a series of albums for Ridge Runner called Festival Favorites. Rounder Records released a compilation of the best of those recordings. This is the tab book of all the banjo solos from that CD. Includes, “Salt Creek,” “Cripple Creek,” “Clinch Mountain Backstep,” “Doug’s Tune,” “Shenandoah Valley Breakdown,” “Dusty Miller,” “Little Rock Getaway,” “Sally Goodin’,” 20 tunes in all. 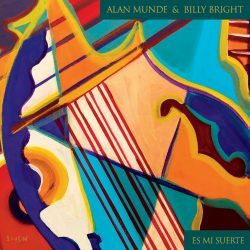 ALAN MUNDE, IN THE TRADITION Book/CD – My favorite of my Ridge Runner recordings is In the Tradition. It feels especially good to me even after all these years. It features the late and really great Dobro man, Gene Wooten. Five by Two is a very fine two-banjo piece written by and featuring Bill Evans. Joining in on much of the music are Billy Joe Foster on bass and fiddle, Roland White on mandolin and guitar, a special guest appearance of Craig Fletcher on mandolin, and Joe Carr on guitar and mandolin. BANJO SANDWICH TAB BOOK – Tab book of all banjo solos from this best selling CD. This is the album that really kicked my career into gear. Originally released in 1976 it became a big seller for me. It is now available in CD format. “Dear Old Dixie,” “Darcy Farrow,” “Sally Johnson,” “Sleepy Eyed John,” and many more. BETH MEAD – BIG BANDJO SWING CD – This is a super CD of really great big band and pop tunes of the 1910 –1926 era done up with tasty banjo arrangements by the super-talented Beth Mead. If you are looking for a CD of bluegrass style picking that bluegrassers and non-bluegrassers alike could enjoy, this is it. Different and enjoyable! Plus, the hot guitar solos and guitar rhythm is provided by me – I love the guitar and it is my great hobby. DAPPLE PATTI CD – Adam Granger and I have been playing dates together for many years. Dapple Patti is a live recording from 2011 concerts of ours in Minneapolis, Mn. and Madison, Wi. I really love playing music with Adam and the duo format gives me plenty of opportunity to stretch out and play in ways that are somewhat new to me. I love all 17 cuts and the feel of the recording. Hope you do too. JAZZ GRASS CD – Slim Richey – In the 1970s Slim had the idea of combining jazz and bluegrass. He gathered around many of the hot bluegrass pickers of the day to help him on this project – Bill Keith, Richard Greene, Sam Bush, Ricky Scaggs, Joe Carr, Gerald Jones, and Alan Munde – a unique and beautiful presentation of jazz with bluegrass instruments. MADE TO LAST CD – This sparkling new offering features many bluegrass classics to-be. Four really fine performances of Elliott Rogers’ compositions, “Wave Goodbye,” “Little Teardrops,” “From the Penthouse to the Poorhouse,” “Haul Away,” and two by Bill Honker gems, “Made to Last,” and “Above the Waterline.” I offer a couple of new instrumentals with the steaming versions of “Traditional Family Breakdown,” and “The Run of ‘89”. Steve Smith, accompanied with unsurpassed mandolin styling, sings a song of love lost with “Fool’s Gold,” and soars on the bad man ballad “John Hardy.” Nate Lee on fiddle shines as no other on all the cuts and offers a twin fiddle arrangement of the Bill Monroe classic “Brown County Breakdown.” Bluegrass Made To Last. Wave Goodbye • Fool’s Gold • Traditional Family Breakdown • Made To Last • Little Teardrops • Brown County Breakdown • Above the Waterline • John Hardy • Penthouse to the Poorhouse • The Run of ’89 • Haul Away • What’s So Good About Goodbye? OLD BONES TAB BOOK – Over my many years in the studio, several songs and instrumentals recorded never made it to vinyl (the format in those days) for various reasons – never because the recorded efforts were not worthy of release, but because of career timing, personnel change, finances, and such. I have gathered these fine and varied performances together offer them in this CD package. Features, David Grier, Gene Wooten, Joe Carr, Roland, White, Mike Compton, Marshall Wilborn and many other talented musicians. POOR RICHARD’S ALMANAC Book/CD – This is the first recording for Sam Bush, Wayne Stewart, and me. This 1969 album was recorded in Wayne’s grandmother’s house out back on home recording equipment of the day. As a result the fidelity is low but the music quality and enthusiasm is high. We were all young and eager to play. Tab book includes six tunes from the album – Molly Bloom • Jubilee • Dusty Miller •Lil’ Joseph • Other Side of Baker • Little Big Horn • Sally Goodin’. SOLO BANJO CD – Here are some of my favorite tunes just to sit and play. It also features an impressionistic piece “The French Broad (The River Song),” and a classical number “Pavan for a Dead Princess.” Also included are “Gold Rush,” “Old Joe Clark,” “Titanic,” “Red Wing,” and many more. THE BANJO KID PICKS AGAIN TAB BOOK & CD – This fine recording features Sam Bush, Jerry Douglass, Joe Carr, Roland White, Mike Anderson, and Slim Richey. It was recorded in Nashville in 1980 and has several of my originals including one of my most popular tunes “Peaches and Cream.” There is great ensemble playing on all the cuts. The tab book includes all my banjo solos. 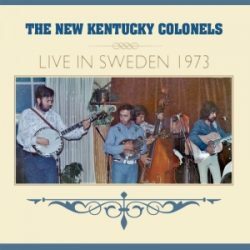 This CD contains all 26 songs performed by The New Kentucky Colonels at the Mosebacke club, Stockholm, Sweden on May 28 and 29, 1973. They have been re-engineered from the original recordings by Ben Surratt and re-mastered by Alex McCullough. Fourteen songs from these performances were previously released on the 1976 Rounder LP 0073. When I joined Roland, Clarence, and Eric to play banjo on the European tour that produced these recordings, it was like being sucked up into a cosmic rhythm whirlwind. As I played there was no place to play other than get with them and hang on. Their playing was beyond the oft-cited sense of brothers or family connectivity – as I say, cosmic. They created a harmonic and rhythmical environment, a context, that made a new and wonderful sense of the music. It seemed to me my normal bluegrass banjo offerings were transformed into hyper-important moments in the music. They had that wonderful, too rare ability to make those around them not just sound better, but maybe sound and play the best they ever had. I think that was the case for me. It was quite something and is abundantly evident to me as I listen to the music. It was and is my honor to be a part of it all. When someone mentions that they really love these recordings, I internally use it as a marker that this person and I may share some understanding of how music can be. “Fire on the Mountain,” “Never Ending Love,” “Take a Wiff on Me,” “Alabama Jubilee,” “I Know What It Means to Be Lonesome,” “Shenandoah Valley Breakdown,” “Blackberry Blossom,” “Blue and Lonesome,” “Good Woman’s Love,” “Dueling Banjos,” “Soldier’s Joy,” and many, many more. It is wonderful to be a part of this really outstanding Austin, Texas based band. The CD features many great original songs and instrumentals. I even get a chance to try a John Coltrane tune, “Lazy Bird,” I have had worked up for a number of years. Billy Bright is and talented and dynamic mandolinist and has several highly noteworthy instrumentals and songs on the project – “Jerusalem Café,” High on the Ohio,” E. Compton Blues,” and “Waltz into Morning.” Geoff Union, a fine guitarist and songwriter, contributes the outstanding instrumental, “Over and Out,” and songs “Spirit of ’94,” “Ferris Wheel,” and “Many Paths Along the Way.” Brian Smith sings a powerful version of “I’ve Just Seen the Rock of Ages,” as fiddler Eric Hokkenen adds the just right mournful touch. Rounding out the group is multi-faceted bass man, Mark Rubin. Hello City Limits, High on the Ohio, Ferris Wheel, Jerusalem Café, Homesick, Lazy Bird, Many Paths Along the Way, E. Compton Blues, Spirit of ’94, Waltz into Morning, I’ve Just Seen the Rock of Ages, Over and Out.